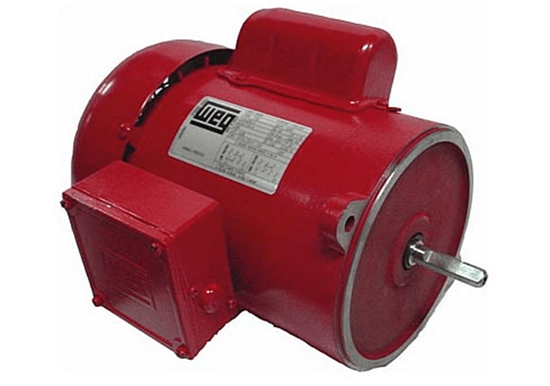 WEG Definite Purpose Motors - Allied Automation, Inc.
WEG definite purpose motors include auger, brake, compressor, farm, IEEE, saw arbor, stainless steel, cooling tower, pad-mounted, poultry and in line thrust. 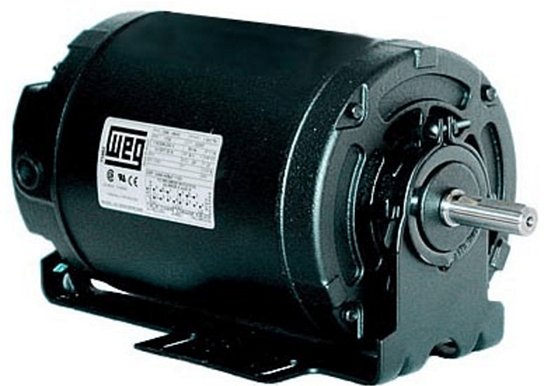 WEG Brake motors consist of an induction motor coupled to a DC brake, forming an integrated compact and robust unit. 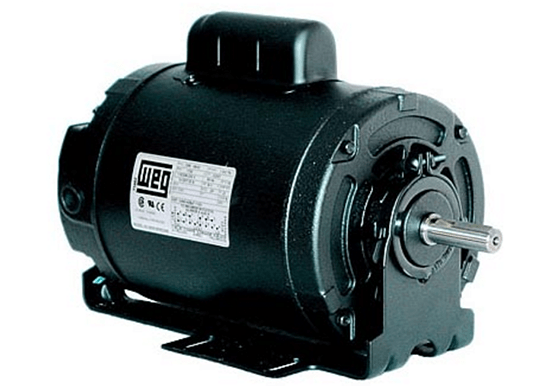 The unit is TEFC, and has the same performance characteristics of WEG TEFC range of motors. The brake is of sturdy construction with few moving parts which ensures long durability with a minimum of maintenance. 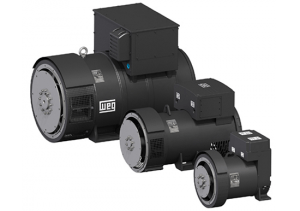 WEG’s W22 Cooling Tower - NEMA Premium Efficiency motors meet or exceed all NEMA Premium and CEE requirements for energy efficiency. These TEFC motors are built according to NEMA specifications and designed for operation in 100% humidity and the most corrosive environments. 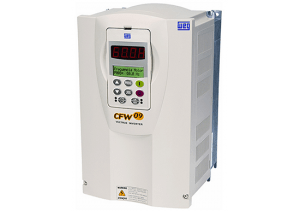 The entire line is certified Inverter Rated for use with a VFD. 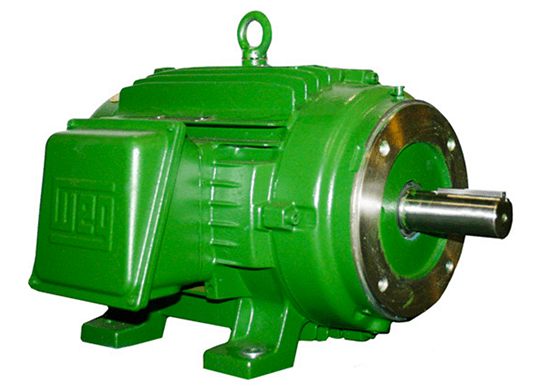 They are designed to operate in either horizontal or shaft up position. 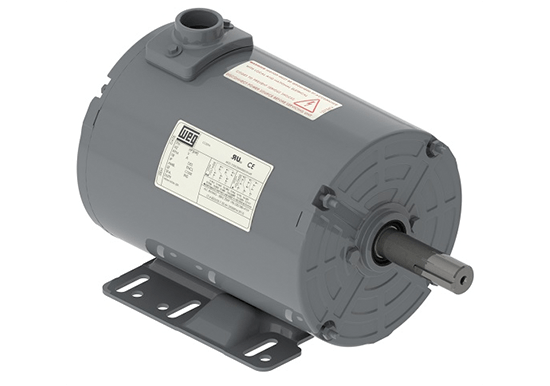 As with any other WEG motor, Cooling Tower motors are tested in accordance with IEEE 112, Method B, and their efficiency values are certified by UL Labs (CSA C390). 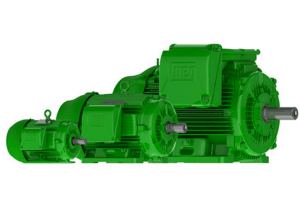 Cooling Tower motors will meet Design B torques, maintaining exceedingly high breakdown and locked rotor torque while providing the highest rated efficiency levels. WEG’s W22 Cooling Tower - NEMA Premium Efficiency motors meet or exceed all NEMA Premium and CEE requirements for energy efficiency. 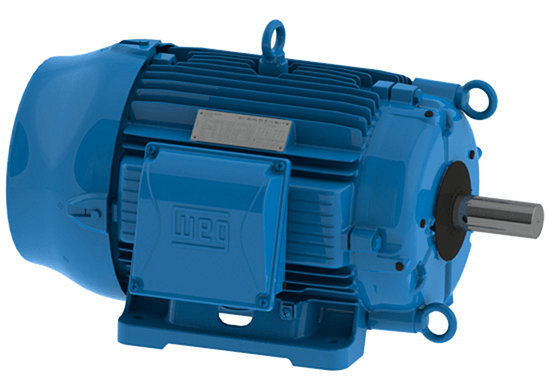 These TEAO motors are built according to NEMA specifications and designed for operation in 100% humidity and the most corrosive environments. 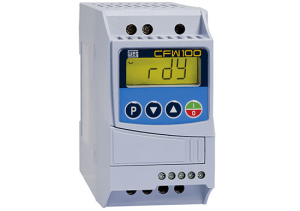 The entire line is certified Inverter Rated for use with a VFD. They are designed to operate in either horizontal or shaft up position. 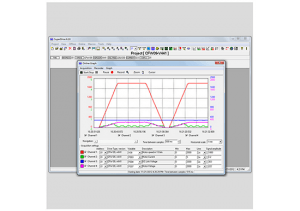 As with any other WEG motor, Cooling Tower motors are tested in accordance with IEEE 112, Method B, and their efficiency values are certified by UL Labs (CSA C390). 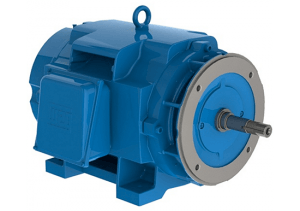 Cooling Tower motors will meet Design B torques, maintaining exceedingly high breakdown and locked rotor torque while providing the highest rated efficiency levels. 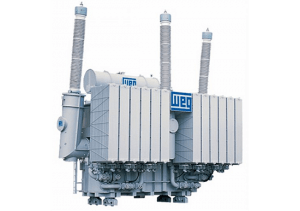 WEG’s W22 Cooling Tower - High Efficiency motors meet or exceed all NEMA Premium and CEE requirements for energy efficiency. 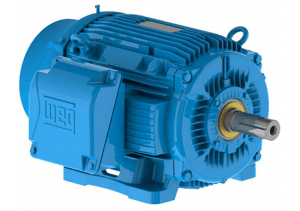 These TEFC motors are built according to NEMA specifications and designed for operation in 100% humidity and the most corrosive environments. 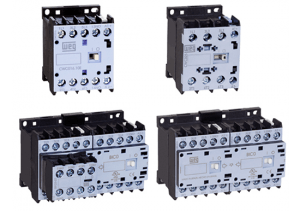 The entire line is certified Inverter Rated for use with a VFD. They are designed to operate in either horizontal or shaft up position. 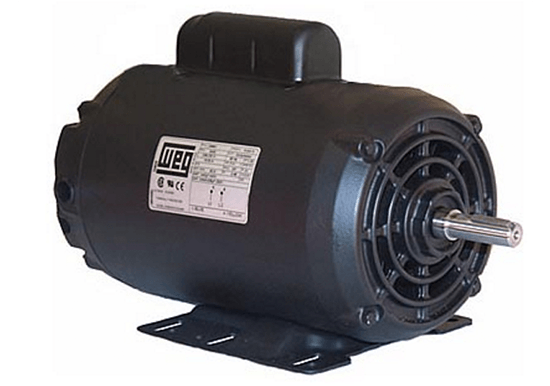 As with any other WEG motor, Cooling Tower motors are tested in accordance with IEEE 112, Method B, and their efficiency values are certified by UL Labs (CSA C390). Cooling Tower motors will meet Design B torques, maintaining exceedingly high breakdown and locked rotor torque while providing the highest rated efficiency levels. These high quality motors are designed to meet the high torque requirements of air compressor loads. Ball bearings designs and manual reset thermal protection are standard features on all ratings. 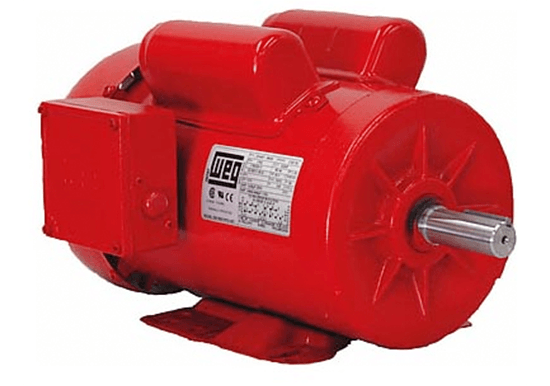 These heavy duty motors are rolled steel constructions NEMA 56 frames. 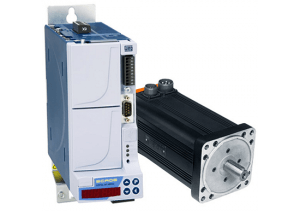 Special electrical and mechanical features ensure reliable service and long motor life. 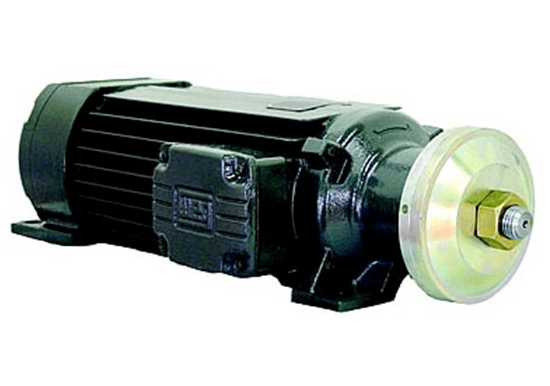 This new product line was designed specifically for Inverter Operation, allowing its use in applications where 1000:1 constant torque turndown ratio is required. 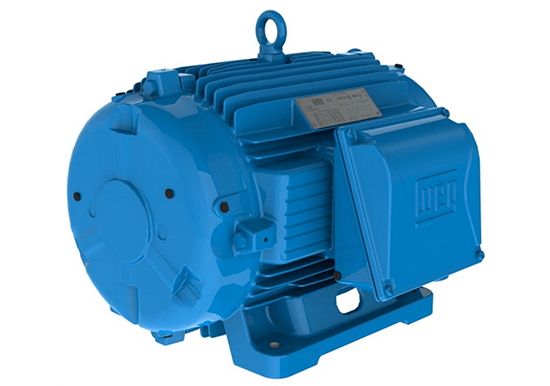 WEG’S Pad Mount - NEMA Premium Efficiency motors meet or exceed all NEMA Premium and CEE requirements for energy efficiency. 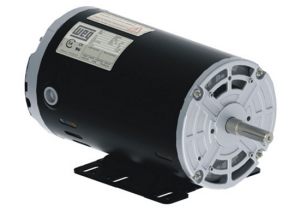 Pad Mount – High Efficiency motors also meet or exceed CEE. The efficiency values are certified according to the DOE’s regulations (Certificate of Compliance number CC029A). These TEAO motors are all cast iron construction, with enclosures rated IP55. They are provided with a detached terminal box and extended leads for remote installation. They are painted with WEG’s own special system, using synthetic enamel alkyd resin paints, which exceed the ASTM B117 standard for salt spray test. The Pad Mount line is rated for 1.25 Service Factor up to 100HP. And the entire line is certified Inverter Rated for use with a VFD. This rating meets or exceeds MG1 Part 31 NEMA Specifications. 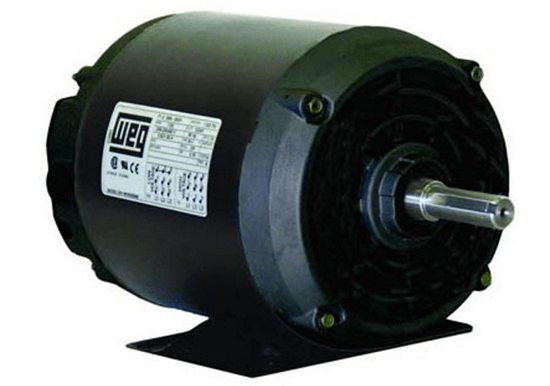 WEG poultry fan motors are specifically designed for agricultural fan applications. Mounted within the airstream for proper cooling, the totally enclosed design ensures long life in poultry house and barn exhaust fan applications. 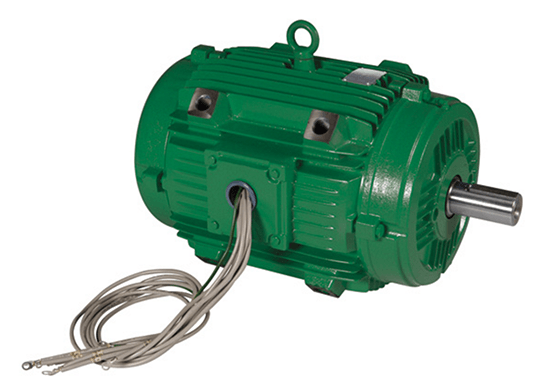 WEG Auger Drive motors are specifically designed for Feed-Drive units requiring a reliable and efficient motor. 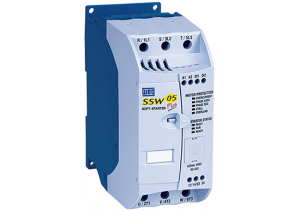 Provided with mechanical protection of centrifugal switch to prevent damage to the motor in case of overspeed, manual thermal overload protection and two bolts mounting NEMA "N" flange. 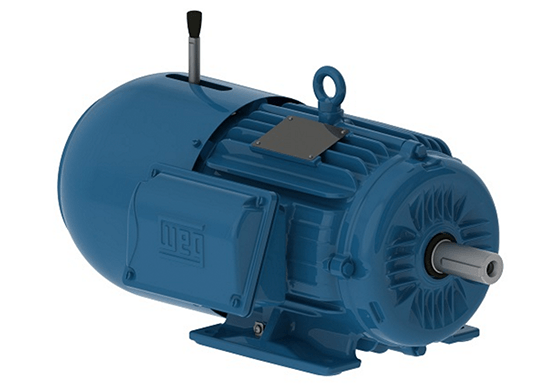 The "FARM DUTY" motors are specially designed for farm duty applications requiring high starting torque and moderate starting current. Some standard features such as V-ring slinger in both drive and opposite drive ends, reversible shaft rotation and start capacitors provide versatility for indoor and outdoor use. The manual overload protection available in all frames protects against extreme overloads offering maximum operator safety. 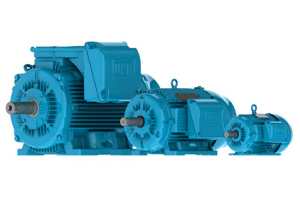 Single and double shaft end available, these motors are suitable for a wide range of applications such as circular saws, pendulum saws, polishing machines and others. Motors are all cast iron and have service factor 1.0. They can replace conventional circular saw drive systems. 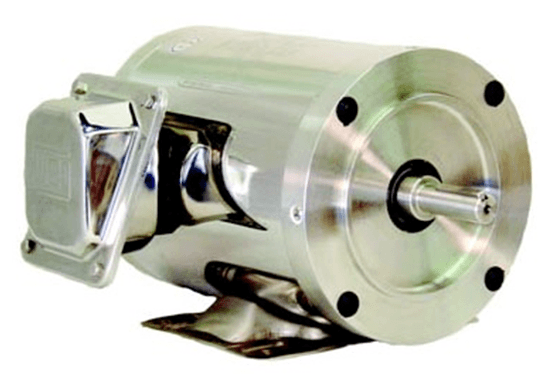 For food processing, pharmaceutical and other environments requiring extreme cleanliness and frequent washdowns, WEG offers a new design all-stainless steel motor, called the SHARK™. It's well-known that nothing stands up to a wet or corrosive environment as well as stainless steel. That's why it's considered the most desirable material for washdown duty motor frames and other exterior motor surfaces. And the entire line is certified Inverter Rated for use with a VFD. This rating meets or exceeds MG1 Part 31 NEMA Specifications. The Shark series of Stainless Steel products also includes our new Stainless Steel CFW-09 Drive Control. 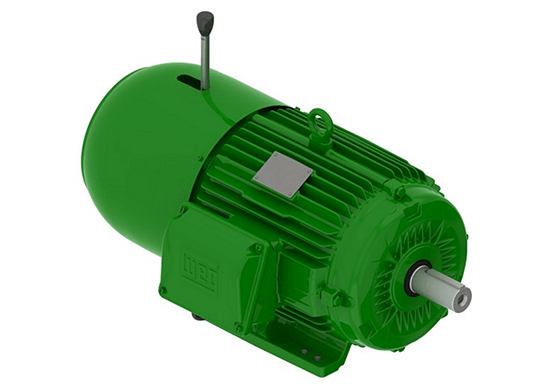 Motor especially developed for application in ventilation in grain dryer machines.